Image caption The Trust said emergency departments were "busy as would be expected over a bank holiday weekend and in line with the regional position"
The Southern Health Trust has defended its bank holiday service after a South Down MLA raised concerns of "crisis conditions". Sinead Bradley claimed that A&E services were "gridlocked" and that "there was no GP cover in Banbridge or Craigavon" on Sunday night. 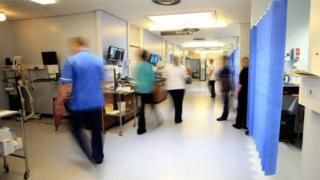 However, the trust said emergency departments were "busy as would be expected over a bank holiday weekend". It said this was in line with the regional position". In a statement it said: "The service (GP OOHS) has run as normal over the weekend. Base visits on Sunday night were available on other sites in the absence of a GP in Craigavon." It also added: "The trust is happy to respond to any concerns raised by public representatives, but not currently aware of any contact with trust senior staff by the SDLP." Mrs Bradley claimed she had "received reports from concerned frontline staff in our local hospitals about the pressure on acute services". "They have described being forced to move patients around 'like dominoes' to find any available bed," she said. "We have nurses and doctors working to the point of exhaustion in our health service just to keep it afloat. "But they can't keep treading water forever. We need strategic political intervention to advance the transformation plan and to deliver better outcomes for patients, their families and our staff," she added.